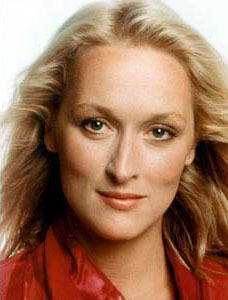 An awkward, uncomfortable, and not particularly attractive girl from Jersey, Streep says she had little confidence in herself until attending Vassar, an all-women's college. "How we looked was not important, instead how we thought was more important. How we argued, learned, discovered, laughed and joked mattered. I felt like a human being, not a woman or child, and felt the quality of my own character." For Sophie's Choice, she learned Polish. For Music of the Heart, she learned the violin, and played five hours daily. She has been nominated for 13 Oscars, more than any other performer (Katharine Hepburn is in second place, with 12 nominations). In the 25 years from 1978 to 2002, she was Oscar-nominated more years than she wasn't. She has taken home three of the statuettes, for Kramer vs Kramer and Sophie's Choice and most recently, The Iron Lady. After winning her first Oscar, she accidentally left it on top of a toilet after the awards ceremony. Streep has become more outspoken politically in recent years, taking public stands against domestic violence, water pollution, nuclear power, and George W. Bush. "What pushed me over the edge?" she asked. "Name a topic. Everything pushed me over the edge! The quiet dismantling of environmental regulations. The phoniness of No Child Left Behind. Everybody should be getting up and making a big fat noise... Yes, of course, I always question why anyone would listen to an actor. But it's not your profession that defines you so much as your personhood. I listen to all kinds of people whose qualifications to opine on anything are that they have a radio show or a degree in art history. Our most famous president of late was an actor. You don't jettison your citizenship because you're famous."